A delicious and healthy cauliflower salad can be made in approximately half an hour and will make you look at the humble cauliflower in a different way. To make your cauliflower salad first take a saucepan and fill with salted water. Once this water has reached boiling point place the saffron and cauliflower inside and cook for between 4 and 5 minutes. Once you have done this, remove the cauliflower from the water and ensure that all excess water has been removed before placing the cauliflower on a tray, enabling it to cool rapidly. Next take a frying pan and pour the oil in and heat on a high setting. Once tiny traces of smoke start to appear from the frying pan place the chopped red onion inside the pan and fry for approximately 8 minutes, ensuring that you stir the onion regularly during this time. The onion should look crispy after this time has elapsed. Next take the nuts and raisins and cook and stir for approximately 4 minutes. Once this has been completed take the nuts and raisins and drain off the excess oil using a sieve, before placing them in a large bowl. Next mix the nuts, raisins, cauliflower and onion and pour extra virgin olive oil over them and mix with the herbs. First take a large bowl and mix the cherry tomatoes, broccoli, olives, feta and cauliflower. Next pour some Italian salad dressing into the bowl, ensuring that all the ingredients are well coated. Once this has been completed leave overnight in the fridge. 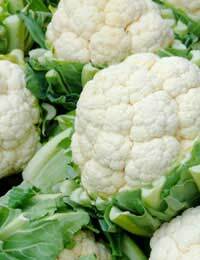 It is possible to use both raw, steam or boiled cauliflower and broccoli in your salad. First cook the cauliflower in salted water until it becomes tender. Once tender remove from water and allow to cool. Once cooled remove the hard stems, so you are left with just the floret. Next use the lettuce leaves as a bed and place the florets on top of the leaves. Take the bacon and fry until crispy. Once crispy remove from frying pan and drain off any excess oil. Once you have done this make your dressing by mixing vinegar, salt, pepper and oil. When well combined pour the dressing over the cauliflower and top with bacon and parsley.